Business is under constant pressure to grow revenues. Your corporate business structure may be working quite well within the current business environment, but there is always that nagging thought of what’s going to happen in the next 1-3 years within your industry? Is there a disrupter company waiting in the wings to alter your industry? Business issues continue, such as: revenues, unexpected competition, profitability, growth, regulation, etc., all affecting your bottom line. Your current C-Suite executives and managers are loaded with today’s strategic and operational issues. However, that same executive team also focuses on what is going to be your future-ready organization through reinvention and digital transformation. 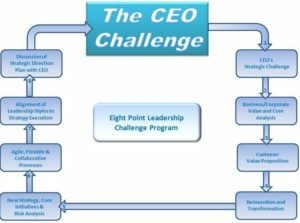 In The CEO Transformation Challenge, the CEO sets a strategic organizational goal and the selected participants, under the guidance of BLI’s C-Suite Mentors, devise an agile strategic plan to reach the goal. The Challenge presents real-world situations with real-world solutions based on up-to-date business research and top-level executive experience. BLI uses current planning processes, including the latest methods from the top business schools, to assist your employees and teams in building a strong organizational future.